Flax-seed oil, rich in Omega-3 essential fatty acids, can provide a simple daily health boost. 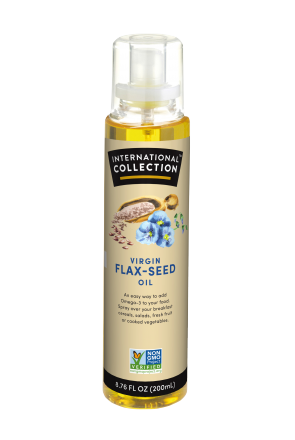 High in healthy fats and especially popular with vegetarians and vegans for its Omega-3 content, International Collection Pure Flax-seed Oil has a nutty flavor that goes deliciously well with both sweet and savory foods. Mix it into smoothies, add to salad dressings or combine with your favorite spread on crackers or toast.